Wales' latest attempt to break their 57-year losing run against the All Blacks comes shortly after the death of one of the central figures of that much-recalled match in 1953. Bill Clark, who was the only All Black debutant on the day, scored their try and conceded the penalty that proved to be the turning point, died in his native Nelson on June 3 at the age of 80. It reduces the number of All Black survivors to seven, compared to five of the Welsh XV. He illustrates a sad truth about rugby recall. It appears that only the truly legendary or the highly picturesque are likely to be widely remembered half a century after the end of their careers, although it remains to be seen whether the wider availability of television pictures makes subsequent generations more historically durable. The merely exceptionally good are wont to rather fade from the record. Of that All Black team fullback Bob Scott, lock Tiny White and prop Kevin Skinner - all happily still with us, rank among the undoubted legends while the late Bob Stuart had the distinction conferred upon anyone who captained an All Black tour in the days when they happened once or twice per decade. Clark belonged to the echelon immediately below - a very, very good player indeed. As a fast, highly athletic back-rower he fulfilled a variety of functions. His exceptional pace made him an immensely effective spoiler in defence, but also an extremely dangerous attacker. As a team-mate of brilliant wing Ron Jarden for 230 matches at Victoria University, Wellington and the All Blacks he was renowned for tries he scored from cross-kicks by the wing, although he particularly cherished the occasion when the roles were reversed and Jarden scored from his kick. That pace also, in the era before replacements were allowed, gave him a crucial secondary role - as the man who was quick enough to be moved into the backs should a reorganisation be forced following an injury. Those talents probably reached a peak in 1956 when the All Blacks played the Springboks in arguably the most vehemently contested series, on and off the pitch, of the 20th century. The memories that have gone into legend are of recalled former boxing champion Skinner's demolition of the previously dominant Bok props and Peter Jones informing a rapt but still rather strait-laced nation that he was 'absolutely buggered' after an epic solo match-winning try. But as Stuart, who had an assistant coaching role in that series, later said: "Bill was the key man. He made Peter Jones the great player he was that year. When Peter was recalled, you couldn't rely on him in cover defence, so we had to rely on Bill to get back and do that work." Those talents were already clearly in evidence at Cardiff in 1953, when his prime task was to bottle up the vivacious brilliance of Welsh outside-half Cliff Morgan. Who won that battle depended on which newspaper report you believed with E.W.Swanton in the Telegraph giving the verdict in a clash of physical opposites to Clark, while the New Zealander Terry McLean reckoned Morgan had shaded it. Each, characteristically, showed a warm regard for the other - Morgan recalling an opponent who was particularly troublesome because he ran at you on a curve, making distance and angles hard to calculate - while Clark said: "I'm not sure I ever did catch him." Where he undoubtedly did catch Welshmen was in the first half with the score at 5-3 to Wales. An up'n'under from Scott was allowed to bounce and Clark pounced first to score. Many years later he recalled: "A feeling of great pride in the achievement coupled, of course, with the standard practice for the era of displaying extreme modesty and bashfulness. I know I had every right to be modest and bashful - I didn't beat anyone with ball in the hand - all I had to do was fall on the thing after somebody dropped it!" Any sense of beginners' luck was, though, cancelled out in the final few minutes as Wales, still trailing 8-5, pressed and he was penalised for playing the ball while on the floor. As he remembered: "I was on the floor. I didn't know where the ball was and I had one leg trapped under Tiny White and was trying to push myself out." Sixteen years later, when the first Welsh touring team to visit New Zealand played its first match at New Plymouth, McLean was to encounter Clark 'gleaming with delight' at being told by Clem Thomas - whose cross-kick would set up Wales's winning try a few minutes after the penalty had levelled the scores - that the penalty should not have been awarded. The infrequency of international rugby in those days meant that Clark played only nine tests, the last in 1956 when he played an emergency back role in two of the three tests against the Boks. He was also involved in the memorable victory by New Zealand Universities over the tourists, and long recalled the defeated Boks reneging on their promise to attend the after-match function - one element perhaps in how he came to take a less pro-South African view that most of his rugby-playing contemporaries, opposing the divisive Springbok tour of 1981. 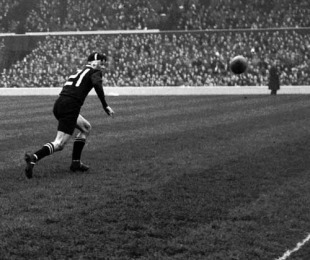 His death comes only a few weeks after that of Wales's 1953 debutant, Gwyn Rowlands - the man who kicked that contentious penalty. The two are linked by that event, and in personal memories. When I wrote Dragons and All Blacks, about that match, it was perhaps inevitable that both would figure largely - each had a memorable story and neither had been interviewed nearly as much as colleagues like Bleddyn Williams and Bob Scott. Each, though, went out of his way to assist - leaving memories of two men, linked forever by a memorable afternoon in Cardiff in December 1953, who were not only very fine rugby players but - still more importantly - decent human beings.